The Holy Book of the Elcesaites. Relation to Other Judæo-Christian Sects. A Judæo-Christian sect of Gnostic tendencies, whose period of influence extended from about 100 to 400. The Church Fathers, who alone mention the sect, derive the name from the alleged founder—'Hλξαί (Epiphanius),' Hλχασΐ (Hippolytus), or Ελκεσαΐ (Eusebius, Theodoretus). Epiphanius, who mentions as Elkesai's brother a man called Iεξέος ("Hæreses," xix. 1), explains the name as being derived from the Hebrew [Aramaic] = "strength" and = "hidden"; with which the name 'Iεξέος = corresponds, both names designating their owners as the teachers of the "hidden power" and "the hidden God." At the time of Epiphanius the "saints" of the Elcesaites were two women—Martha ("mistress") and Marthana ("our mistress"). The Elcesaites based their doctrine on a book which they claimed either had fallen from heaven, or had been given by an angel to Elkesai at Seræ, Parthia, Elkesai then giving it to Σοβιαΐ ("the Baptist"; from ). Fragments of this book, found in the works of the Church Fathers, have recently been collected by Hilgenfeld ("Elxai Libri Fragmenta," in his edition of "Hermæ Pastor," 1889, pp. 228-240). But the date of the book is uncertain; Ritschl and Harnack assign it to the second half or the close of the second century, while others, following the statement of Hippolytus (l.c. )place it about 100. 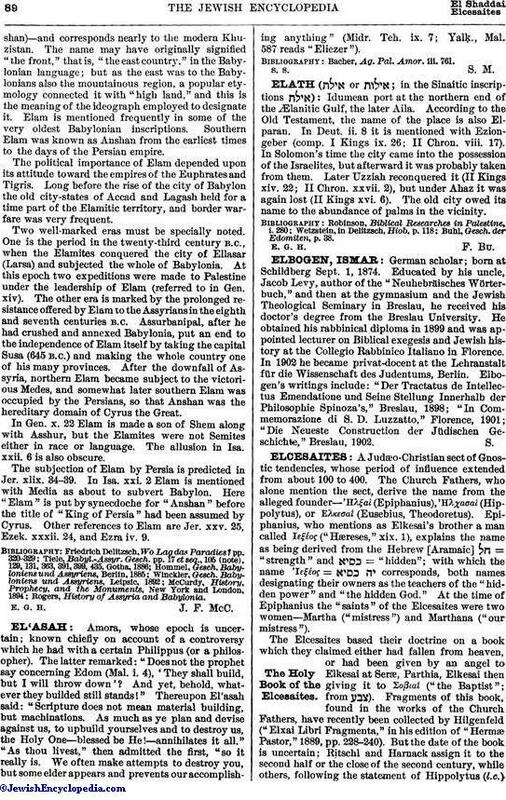 The book is characterized by Epiphanius as containing the doctrine of persons "who are neither Jews nor Christians nor pagans, but hold a middle position between these" ("Hæreses," liii. 1); and in fact the creed of the Elcesaites contains such a mixture of Jewish, Christian, and pagan elements that a classification of the sect is extremely difficult. They must be regarded as Jewish because they expressly insisted on "the rule of the Law," and held that "the faithful must be circumcised and live according to the Law" (Hippolytus, "Hæreses," ix. 14). Special emphasis was laid on the observance of the Sabbath (l.c. ix. 16), and the turning of the face toward Jerusalem during prayer (Epiphanius, l.c. xix. 3). At the same time they asserted that sacrificing had not been enjoined upon the Patriarchs, and condemned it altogether (compare Uhlhorn, "Homilien und Recognitionen," p. 396). The Christo-Messianology of the book is very ambiguous. The Messiah is conceived, on the one hand, as an angel of giant dimensions, a concept that recalls Shi'ur Ḳomah in the Cabala, and Adam in the Haggadah; and, on the other hand, the doctrine of the continuous incarnation of the Messiah from Adam to Jesus (see Adam Ḳadmon) is taught. A strongly marked naturalistic-pagan element is found in the prescribed ablutions which among the Elcesaites answered to the Christian baptism. Water was held sacred by them—an ancient pagan conception widely spread, especially in Babylonia (Anz, "Ursprung des Gnostizismus," pp. 99 et seq. ); hence the Elcesaites preached not only forgiveness of all sins with the new baptism, but also enjoined ablutions against madness, consumption, and possession. During baptism they invoked, besides God and His son, the great king, also heaven, earth, water, oil, and salt, representing the five elements, according to the ancient Semitic conception. It may also be gathered from Hippolytus' quotations from the book of the Elcesaites that astrology and magic were prominent in their religion. The doctrine of Elcesai is as follows: "There exist wicked stars of impiety. This declaration is now made by us: O ye pious ones and disciples, beware of the power of the days of the sovereignty of these stars, and engage not in the commencement of any undertaking during the ruling days of these." The Sabbath is important as "one of those days during which prevails the power of these stars." For a similar astrological reason no work must be begun on the third day from the Sabbath—Monday (Hippolytus, l.c. ; compare Astrology; Mandæans). The asceticism of this sect, which forbade the eating of meat, but maintained the sanctity of marriage, must be noted. According to Epiphanius, Elcesai and his brother Jexai had joined the Ossæans, probably identical with the Essenes, who, as well as the related sect of the Nazarites, recognized Elcesai's authority. They lived in the region beyond the Jordan, offering no sacrifices, and condemning the use of meat. 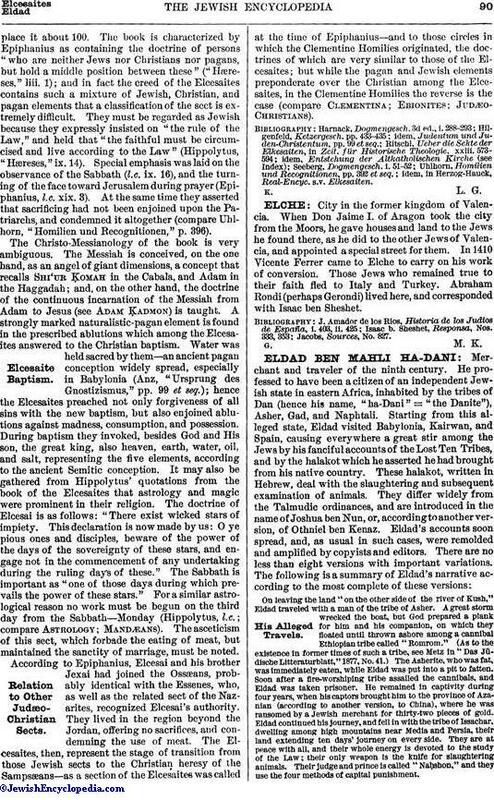 The Elcesaites, then, represent the stage of transition from those Jewish sects to the Christian heresy of the Sampsæans—as a section of the Elcesaites was called at the time of Epiphanius—and to those circles in which the Clementine Homilies originated, the doctrines of which are very similar to those of the Elcesaites; but while the pagan and Jewish elements preponderate over the Christian among the Elcesaites, in the Clementine Homilies the reverse is the case (compare Clementina; Ebionites; Judæochristians). idem, in Herzog-Hauck, Real-Encyc. s.v. Elkesaiten.